Off-grid and ideal, Raven House is about solitude and simplicity. Want to ponder life things? Perfect, this is the spot for you. The local cedar, spruce, and pine walls want to hear your thoughts and soak up your sorrows (or whatever you're there for). The owners are straight-forward and they've supplied everything you could need, laying out all the details super clear and concise. You'll want to be comfortable existing amongst wildlife if you book and brush up on your fire starting skills as your main source of heat during the winter is a wonderful little wood fire stove. To top it off, the aesthetics and design of the place are off the charts. Reconnect and reinvigorate. Located 90 minutes north of Toronto by seaplane, this outpost is free of wifi and electricity, boasting wooden floors, canvas walls, and jute carpets. They provide uniquely Canadian food --- like line-caught Salmon and oysters --- and their main goal here is to really give you the chance to reconnect with nature. It seems like you'll have a lot of time to just be human and that doesn't sound too bad at all. 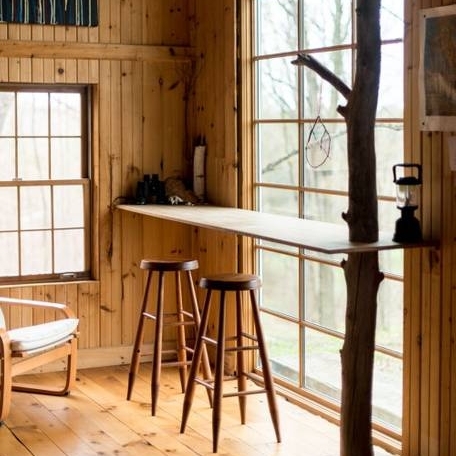 A one-room cabin based on a shed style, their use of windows is perfect. It's off-grid so don't expect running water, but you will have a propane stove and a wood fire stove. This is an un-plug and disconnect sort of cabin -- go explore the woods and trails, waste time, find the ponds and enjoy the 127 acres of private property it resides on. You'll be near the upper Adirondacks and the Algonquin provincial park. Not far from town, you can grab supplies if needed, but try to remember it all because you probably wont want to leave. Ideal for 2 adults. If that live-edge countertop isn't enough for you, we're not sure what is. This little cabin features a beautiful roll up window and really stunning views with huge picture-frame windows and a double bed to take it all in from. This mobile cabin lives on 576 acres, is near a private lake, and has heating, solar power, indoor/outdoor bar, shower, and even a canoe. About an hour and a half from Ottowa and three hours from Toronto, you should easily be able to find your way. A 4WD vehicle is recommended, but not necessary. In Englishtown, Nova Scotia, this cabin for up to 6 is really far away, but also wonderfully located among so much beauty you won't mind. As they say, it's a camping cabin so don't expect anything besides a place to sleep and stunning views. You have a bathroom, it's exceptionally peaceful, and it's clean as can be. You can stargaze, fall asleep to the crashing Atlantic, and wake up in a loft. Can't really ask for too much more. This is a getaway. The cube is perched on the rocky shore, facing south. With minimalist design and striking lines, it's a simple structure with a beautiful aesthetic. Even though it's off-grid, you still have a hot shower at hand, plus solar electric. It's of note that this cabin is part of a larger project that aims to bring social businesses back to this small town in Newfoundland-Labrador. It really is beautiful and faraway so keep the hike in mind when packing up.